Preheat your grill to medium (or indirect) heat. 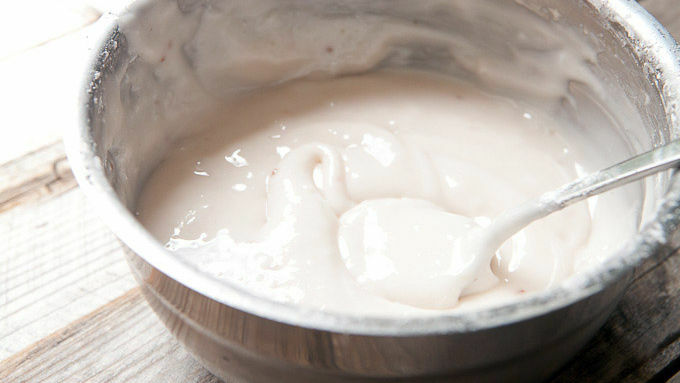 For yogurt frosting, combine yogurt with powdered sugar and honey. Stir together until smooth and a thick consistency. It should be spreadable and barely pourable. Roll out pizza dough into a large rectangle on a lightly floured surface. When grill is heated, rub it with a wet paper towel. (Use tongs to rub the grates so you don't burn your fingers!) You don't want the grates TOO hot or the dough will burn. After the wet paper towel, rub the grates with a paper towel dipped in neutral oil. 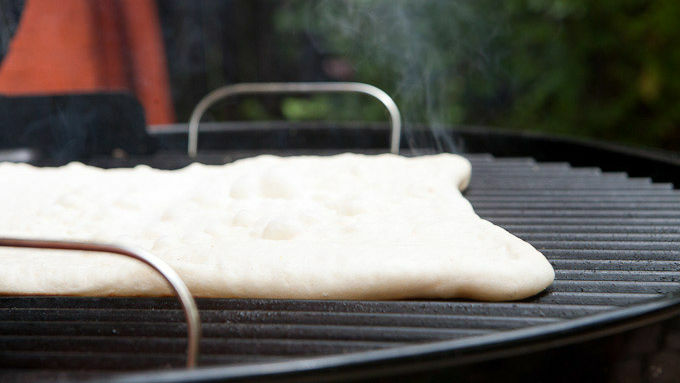 Slide pizza dough directly onto grate. Grill for 4-5 minutes, covered. When bubbles start to form on the dough surface, it's ready to flip. 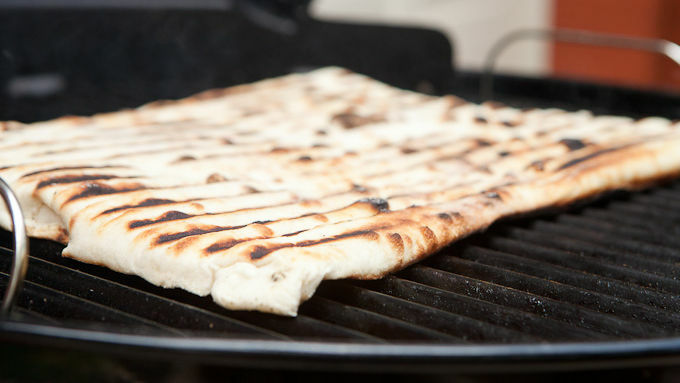 Flip the dough and grill for 3-4 minutes on the second side. Then flip back to original side. Grill for another 1-2 minutes and remove dough from grill when it is crispy around the edges and cooked through. Let pizza dough cool briefly and then spread with a nice layer of the yogurt frosting. 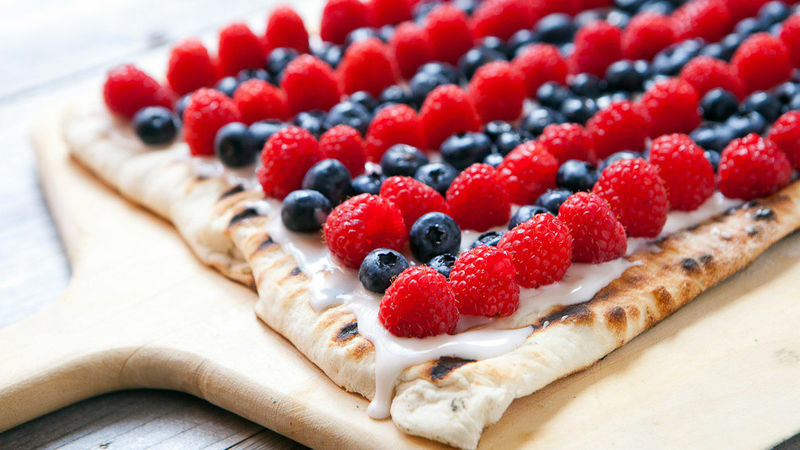 Cover pizza completely with raspberries and blueberries. Slice it up and serve it up! Grill every part of your meal—even dessert! Everybody loves a good weekend grill-out this time of year. Grilling savory foods can be easy enough: burgers, hot dogs, maybe a side salad or some coleslaw. But dessert can be tricky. Most of the time I want something that’s not overly sweet, with some fresh summer flavors. This dessert pizza is everything you need. Make the whole thing on the grill, spread on a simple yogurt-based frosting, and cover the whole thing with perfectly fresh berries. Trust me… it’ll be a hit! It’s the perfect end to a great meal, courtesy of summer and your grill!